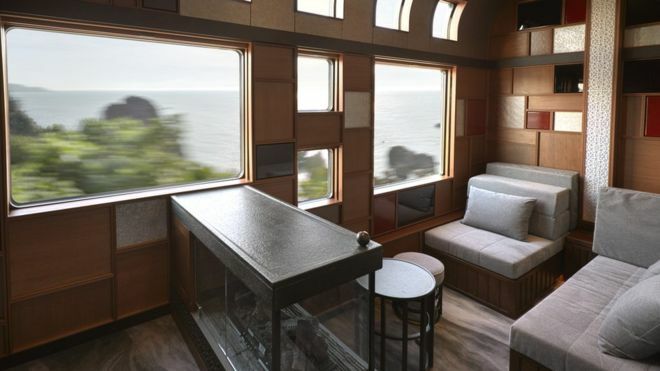 How We Roll, May 4: every train needs a fireplace, right? ICYMI: There are several upcoming outdoor movie screenings in Metro Rail-friendly parks in our region. I happened to be walking my dog near Los Angeles State Historic Park on Saturday night when they were showing ‘La La Land.” Huge crowd — and a bit of a parking mess with many people driving there despite the fact the Gold Line is right next door. Pretty cool. The number of cabs and buses are impressive. The subway tends to get a little muted by them — of course the individual dots don’t show how crowded those trains are. Ohio’s capital is the latest to tear up old routes and replace them with more frequent ones as part of an effort to reverse declining ridership. Misleading headline and lack of skepticism aside, the article is about a University of Nevada Reno effort to develop just getting off the ground to develop a self-driving bus. (UNR has apparently already developed a good PR pipeline to compliant journalists, however). And why would agencies want to ditch human operators? Wired accurately notes that buses are already extremely safe but agencies do get stuck with liability claims and that can be pricey. So that’s one motivator — if you believe self-driving buses won’t also get into scrapes. Not addressed is the issue of how self-driving buses would be staffed by transit agencies. Would there still be a human operator just watching? And why couldn’t buses retrain the human operator and be outfitted with some of the anti-collision technology that is on many cars? Check out the other pics. Too bad there’s not a fireplace car on our trains. Related, the East Japan Railway website is fun to peruse. It’s 64 units, but that’s more than has been built in SaMo in a while.